TALLAHASSEE, FL – Armenian Americans in Florida’s capital will gather for a classical Armenian music concert in commemoration of the 100th anniversary of the Armenian Genocide. Produced by Danny Bedrosian, the Armenian Genocide Centennial Concert will feature select pieces of Armenian music covering over 3 millennia of music. The concert will be held at Florida State University, Opperman Music Hall, on Friday, April 17, 2015 at 8:00 PM. “The Armenian Genocide commemorative concert will be an unforgettable moment for our community,” stated Florida Armenians Tallahassee Chair Margaret Atayants. “We have been planning this commemoration for years, and practicing for months, in an effort to present the Armenian experience and our civilization to the audience,” she said. The concert will be performed by an orchestra of players that Bedrosian specifically assembled for the daunting task of summarizing 3,000 years of Armenian music. With mini lectures included, this unique concert is intended to capture the heart and soul of Armenian music, sampling through many different eras and regions of Historic Armenia, leading up to and after the Armenian Genocide of 1915. “This performance will capture the burning passion in our hearts,” Atayants said. Artists performing include: Daniel Bedrosian, music director, grand piano, vocals, lecturer; Professor Michael Bakan, doumbek, assorted percussion; Dr. Silviu Ciulei, classical guitar; David Cobb, bass guitar; Ramin Yazdanpanah, percussion; Stacy Christofakis, bass clarinet, clarinet, douduk; Margaret Atayants, vocals; Sean Gorman, contrabass/upright bass; Katelyn Best, vocals; Nicole Schommer, vocals. Full musician biographies are available here. 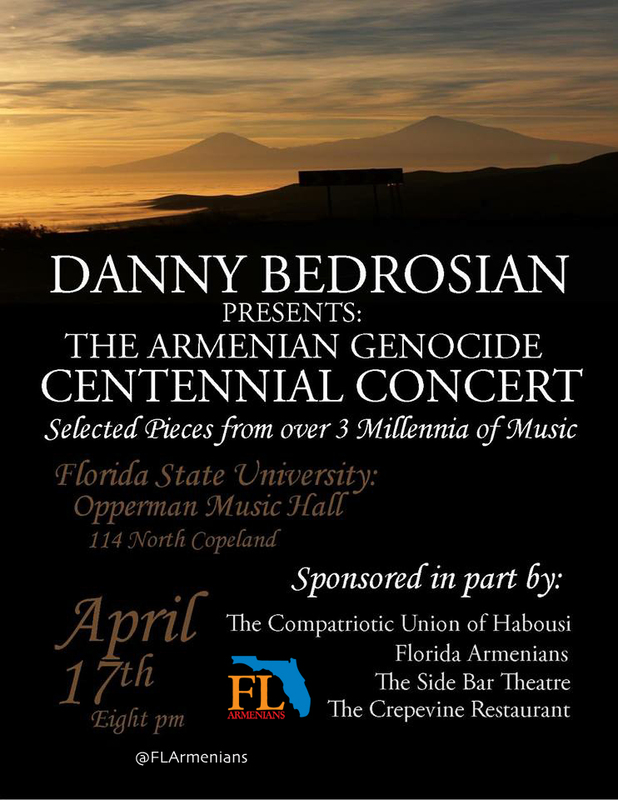 The Armenian Genocide Centennial Concert is produced by Danny Bedrosian and sponsored by the Compatriotic Union of Habousi, Florida Armenians, Side Bar Theatre, and Crepevine Restaurant. The concert is free and open to public. Posted on April 11, 2015, in Armenian Genocide, Arts & Culture, Events, Press Release and tagged Armenian, Armenian Genocide, Classical Music, Concert, Danny Bedrosian, Florida, Florida State University, FSU, Margaret Atayants, music, Tallahassee. Bookmark the permalink. 1 Comment. I am a French singer and can do a C Aznavour show in both French and English for two hours. Please contact me, I live in S Florida.